Soluble in alcohol and aqueous solutions of alkali; sparingly soluble in water. Soluble in ethanol, ether and alkalis. Slightly soluble in water. Bromothymol blue is a large compound with a molecular weight of 625 g/mol. It contains three aromatic benzene rings. The first benzene ring has a thym group attached (the 'thym' part of the name), a sulfur with two oxygen atoms double bonded to it, and another oxygen single bonded to it. 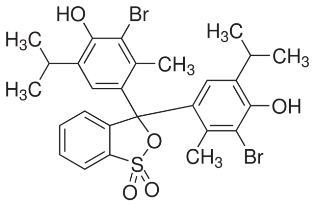 The second and third benzene rings each have a bromine (the 'bromo' part of the name), alcohol (the 'ol' suffix), a tert-butyl group, and a methyl group. This 0.1% aqueous bromothymol blue solution (also known as Bromthymol Blue) is a commonly used pH indicator. Bromthymol blue changes color over a pH range from 6.0 (yellow) to 7.6 (blue). It is a good indicator of dissolved carbon dioxide (CO2) and other weakly acidic solutions. Despite its name, bromothymol blue solution may sometimes appear yellow or reddish depending on the pH of the stock water used to prepare this pH indicator solution. Low levels of carbon dioxide or acid in solution with bromothymol blue indicator will appear blue. As the level of carbon dioxide or acid increases, the solution will gradually take on a yellow tint. This makes bromothymol blue ideal for biology experiments to indicate photosynthetic activity (solution turns blue as plants use up carbon dioxide) or respiratory activity (solution turns yellow as carbon dioxide content increases). Bromothymol blue solution is used as an indicator to determine the rough pH of a substance. It is prepared from a powder, household items and common laboratory chemicals that can be obtained through a scientific supply house individually or as a kit. The mixed bromothymol blue solution will turn yellow in an acidic solution and blue in basic solutions.The main uses of bromothymol blue are for testing pH and for testing photosynthesis and respiration. Bromothymol blue has a blue color when in basic conditions (pH over 7), a green color in neutral conditions (pH of 7), and a yellow color in acidic conditions (pH under 7). So, if we are watching a reaction as it changes pH, we can watch the color change and determine when the pH changes. This is helpful for determining the buffer strength of solutions or determining the end point of pH-dependent reactions. Bromothymol blue is effective when used at a pH range of 6.0-7.6. Below 6.0, it will still be yellow, but it won't deepen in yellow any further, and above 7.6, it will still be blue, but it just won't deepen in blue any further. Bromothymol blue can also be used for testing photosynthesis and respiration, using the same technique as used for pH testing. As photosynthesis occurs, carbon dioxide is used up, and as respiration occurs, carbon dioxide is produced. The changing level of carbon dioxide also changes the pH of the solution because carbon dioxide reacts with water to form carbonic acid, and carbonic acid decreases the pH of the solution.